At Primos, our only objective is to make sure that you get the best grooming experience you have ever had. We invite men and boys of all ages to come and enjoy the lost art of the barber shop - the conversation, the periodicals, the great service and the advice of a real professional barber. Each guest may select a complimentary beverage, a shampoo and his choice of clipper or scissor cut. Facial shaves, head shaves, facials and hair coloring are also available. We also offer a complete line of grooming products and gift cards for special holidays and events. We look forward to seeing you at the shop to "Experience the Primos Difference". 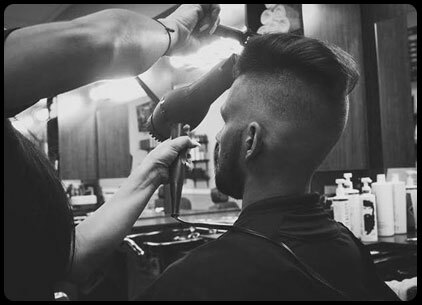 Our barber shops are conveniently located in Pinecrest/Dadeland and West Kendall, making it easy to step in anytime for a haircut and/or shave. Walk-ins and reservations are welcomed. "The barbershop is designed with a classic style, complete with a checkerboard floor, hearkening back to a simpler time and evoking the past." "Primos is a full-service barber shop. Primos Barber Shop in Pinecrest offers men haircuts, hot shaves, shoe shine service and grooming products in a place that's designed with men in mind." "Modern day comforts include oversized, comfortable barber chairs, flat screen TVs at each station and Wi-Fi. Roblejo also stocks his magazine rack with over 30 current choices, offers complimentary beverages and plays a wide variety of music to create a relaxed atmosphere."